The United States Postal Service unveiled new stamps to be released this year honoring the military working dog. “The Postal Service honors the nation’s brave and loyal military working dogs with this new booklet of 20 stamps,” said the postal service in a press release. 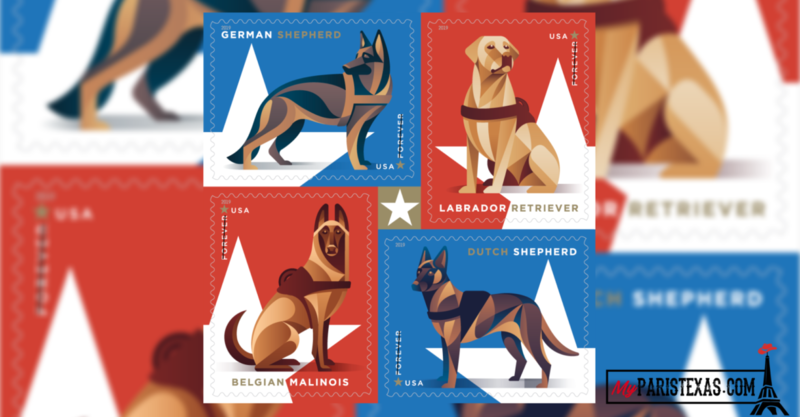 Each block of four stamps features one stamp of each of the following breeds — German shepherd, Labrador retriever, Belgian Malinois and Dutch shepherd — that commonly serve in America’s armed forces. The Postal Service also revealed four additional stamps for this year: a star made of red, white and blue ribbon, an oil-on-linen painting of tennis champion Maureen Connolly Brinker, designs from artist Ellsworth Kelly as well as engines from the Transcontinental Railroad, according to the release. More details on dates and locations for the first-day-of-issue ceremonies are coming.